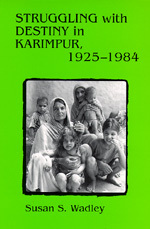 Susan Wadley first visited Karimpur—the village "behind mud walls" made famous by William and Charlotte Wiser—as a graduate student in 1967. She returned often, adding her observations and experiences to the Wisers' field notes from the 1920s and 1930s. In this long-awaited book, Wadley gives us a work of unprecedented scope: a portrait of an Indian village as it has changed over a sixty-year period. She hears of changes in agriculture, labor relations, education, and the family. But Karimpur's residents do not speak with one voice in describing the ways their lives have changed—viewpoints vary considerably depending on the speaker's gender, economic status, and caste. Using cultural documents such as songs and stories, as well as data on household budgets and farming practices, Wadley examines what it means to be poor or rich, female or male. She demonstrates that the forms of subordination prescribed for women are paralleled by those prescribed for lower castes. Villagers also speak of political struggles in India, and of the importance of religion when confronting change. Their stories, songs, and life histories reveal the rich fabric of Karimpur and show how much can be learned from listening to its people. Susan S. Wadley is Professor of Anthropology at Syracuse University.